Painting and poster by J. Craig Thorpe, used by permission. 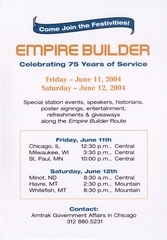 My experience to meet the 75th Anniversary Empire Builder train from Chicago to Seattle started on June 10, 2004 with a red-eye flight from LAX to Chicago Midway airport, followed by a CTA Orange Line trip to downtown. It was wet in Chicago as it had rained hard overnight. At the edge of the airport, I observed a freight train trundling by on the outside of the Orange Line. On the way, the red brick buildings combined with overcast skies made for an interesting mood. A railroad track paralleled the CTA a lot of the way. At Canal Street I could see lift bridges and sailboat masts! I exited the CTA at Quincy Station, asked the agent which way to Union Station and walked the 5 short blocks there crossing the Chicago River. While searching for the Amtrak area, a Metra train had just arrived and I waited one minute for passengers to exit the train and head out to work. Arriving at Union Station at about 6:15 am gave me a chance to photograph the large waiting room with few people in it. During the morning I wondered around Union Station taking the opportunity to see the Metra commuter operation. I found a closed Amtrak counter, which was to open at 7:00 am. By 7:15 am there was a constant line of 10-15 people. At first, I thought I needed the checked baggage window, and waited until 7:30 am. The baggage agent told me to go to the Metropolitan Lounge since I was a first class passenger on the Empire Builder train. After I stashed my wheeled Pullman and asked the nice agent Judy where to have breakfast at a place other than the fast food available in the newer station building. On the way down Jackson Street to Lou Mitchell restaurant I noticed the old Union Station building was beautiful on its exterior and had planters on it and also two clocks at each corner which stated Elgin time. Lou Mitchell restaurant was crowded with people. I noticed some large groups of people enjoying breakfast together. I ordered an omelet which was a very large portion which I could not finish. Unfortunately, they allow smoking in restaurants here….yeech! At an adjacent table, I noticed a couple of whom the man had a golf shirt which had an Amtrak logo on it, talking shop with his wife. Lou Mitchell restaurant is the official begin and end of the famous U.S. Route 66. According to my Chicago contacts, many European people who visit the United States come to this restaurant for their Route 66 kickoff. It was so fitting that Judy sent me there! 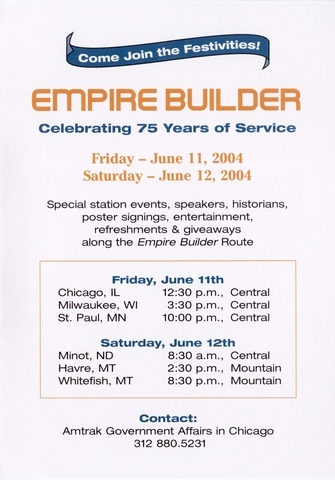 At around 11:30 am, a room close to the Amtrak Passenger Services office was opened and set up for the send off reception for the 75th anniversary Empire Builder train. Mr. David Gunn, president of Amtrak was to be at the party and ride the train from Chicago to Whitefish, Montana. He would have liked to ride to Seattle, but a prior Amtrak commitment made this impossible. At the reception, I met representatives of Canadian Pacific Railway whom host the Empire Builder from Chicago to St.. Paul Minnesota. 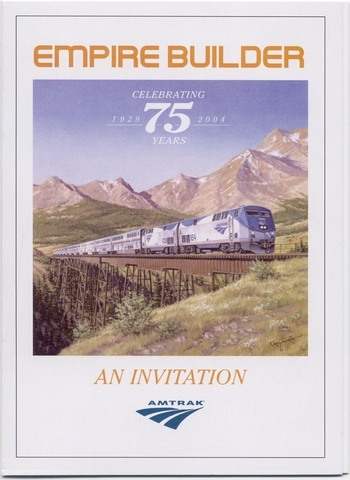 Also at the reception was Craig Thorpe, a nationally known transportation artist who was commissioned by Charles Mott to produce the 75th Empire Builder anniversary poster. Both Mr. Thorpe and Mr. Mott are involved in WashARP, the Washington Association of Rail Passengers in Washington state. The Amtrak conductor with Mr. Thorpe had just gotten off work and then joined the Empire Builder to Milwaukee! Many other Amtrak managers were there ranging from the Chicago union station manager to the government affairs manager. Mr. Gunn arrived here with his assistant June Tarpley. Mr. Gunn was available to meet and chat with anyone who cared to talk to him, so I introduced myself. I believe Mr. Thorpe brought this display shown below which was placed in the lower level of the Ocean View Great Dome car during the trip. There was more than one cake! Everyone enjoyed this delicious cake. Jeff Snowden and Stan Jackson were very helpful to me before the reception. Thank You! At 1:30 pm, Ray Lang, of Amtrak handed out boarding passes to the invited guests and led us to the 13 car train which would not fit at the platform. The original idea was to board us through the Beech Grove business car, but instead, we boarded through a crew dorm transition car near the rear end of the consist. 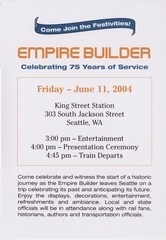 The Empire Builder train usually is set up with the Seattle section at the front of the train after the baggage car and crew sleeper. The Portland section is usually the last part of the train followed by a few express freight cars. 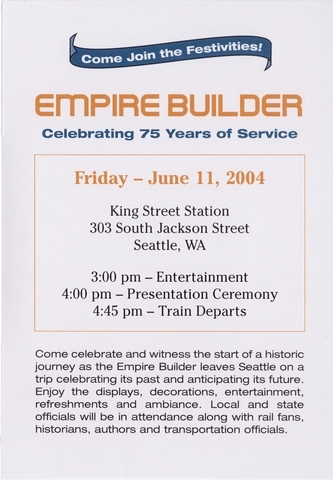 The 75th Anniversary Empire Builder train was set up with the Portland section after the baggage car and the Seattle section at the rear followed by the crew sleeper, the ex-Great Northern Railway Ocean View Great Dome car and the Beech Grove car. Including the two Genesis locomotives, the train had 62 axles. It would stay in this configuration until Spokane, Washington where the train is split into two sections; the other section continuing to Portland, Oregon becoming Amtrak train number 27.